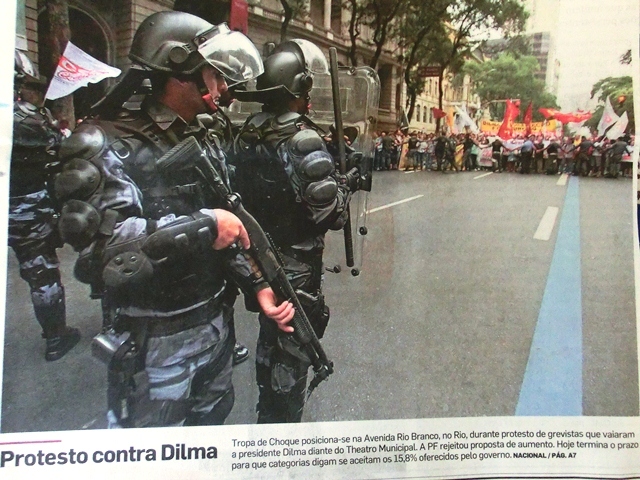 Brasilien, Geldfußball-WM 2014: “Repressing World Cup Protests — A Booming Business for Brazil”. Commondreams. Methoden der Paralysierung von Protestpotential in Brasilien – die Slum-Diktatur. Polizist in Rio macht Mund-zu-Mund-Beatmung bei einjährigem Kind, Opfer von Tränengas in Favela – Ausstellungsfoto der “Folha de Sao Paulo” in Sao Paulo 2012, Ausriß. A tear gas canister made by Rio-based Condor Nonlethal Technologies found on the streets of Ankara, Turkey in 2013. (Twitter/Suzette Grillot)On June 12, Brazilian police fired tear gas on a group of 50 unarmed marchers blocking a highway leading to the World Cup arena in São Paulo. On June 15 in Rio de Janeiro another200 marchers faced floods of tear gas and stun grenades in their approach to Maracana stadium. Armed with an arsenal of less lethal weapons and employing tactics imported from U.S. SWAT teams in the early 2000s, police clad in riot gear are deploying forceful tactics, wielding batons and releasing chemical agents at close range. 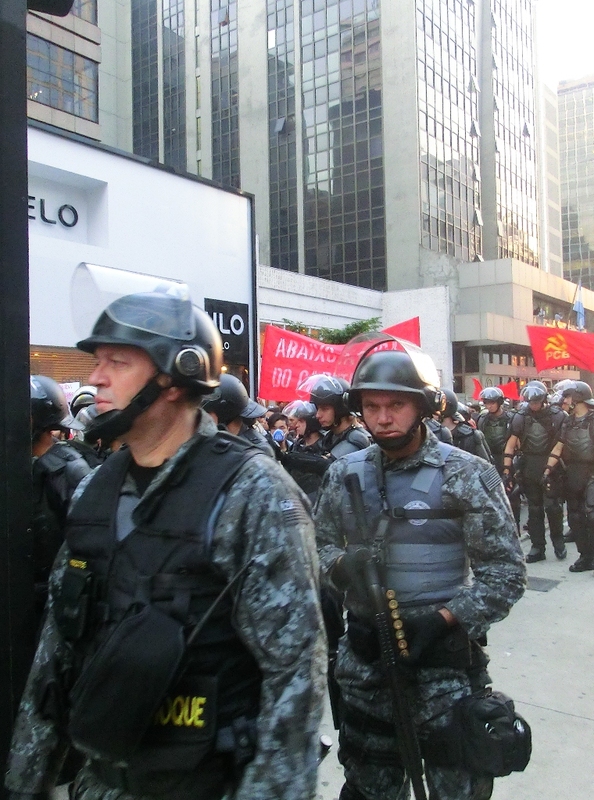 In Brazil, this style of protest policing is not only a common form of political control, but also a booming business. World Cup and related economic protests occurring across the country are bringing in big profits for Rio-based company Condor Nonlethal Technologies. As part of the World Cup’s massive security budget Condor scored a $22-million contract, providing tear gas, rubber bullets, Tasers and light and sound grenades to police and private security forces. Selling riot control and public order weaponry to law enforcement, military and United Nation buyers, Condor’s business has grown by over 30 percent in the past five years. 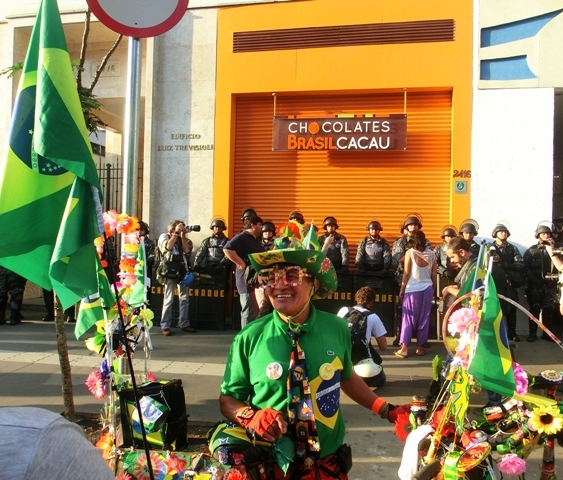 Events like the World Cup and Olympic Games — also to be hosted by Brazil in 2016 — shine a spotlight on national security. Perform well, in the eyes of the industry, and receive invitations around the world for keynote speeches, consultancies and training operations. 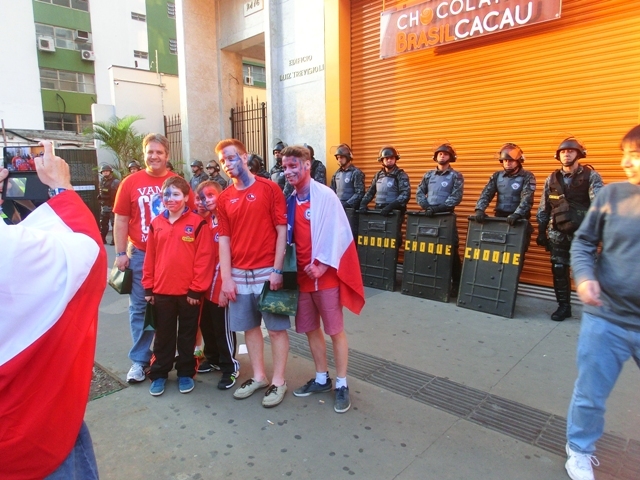 For Condor and the broader Brazilian security sector, the World Cup is like a fashion week; it is an opportunity to showcase the latest police gear, baiting future buyers. While Condor will not officially divulge details of its profits, according to the curriculum vitae of its Marketing Director, the company has international sales of $50 million of non-lethal weapons and ammunition. In recent years Condor has seen an increase in its revenue of 33 percent as a result of a new marketing strategy engaging communication tools and trade show participation. With these initiatives the marketing director has overseen an average sales growth of 90 percent and has increased sales from 12 countries to over 40, with new markets in Asia and Africa. Under giant banners of the Brazilian flag, Condor is now a regular exhibition stall holder at the world’s leading internal security expos, including DSEi and Milipol, where they show off their wares to government and military buyers. 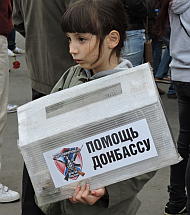 Such new devices on display include the “ballerina grenade,” which jumps on the ground to avoid “throwback” by protesters. Despite their increased use as a deadly force, “riot control” remains exempted from the Chemical Weapons Convention that permits toxic gases to be deployed against civilians. Like other weapons that can be classified as policing equipment, these agents often fall outside of arms sales restrictions. This leaves their for-profit trade even less regulated than the pharmaceuticals industry. Alongside this move to increase the production of police technologies, came changes to policing practices. According to a report by Cirro Barros of Publica, in 2004 Brazil established the Força Nacional to deal with public security emergencies, forming part of a wider plan to expand military training for public order policing. In 2006, Condor and the Brazilian government jointly hosted what was at the time the largest less lethal weapons conference in the world, catapulting them onto the international stage. Speakers included U.S. military expert Colonel John B. Alexander — of “The Men Who Stare at Goats” and UFO fame — as well as Charles “Sid” Heal, a man central to the development of military tactics for policing. Said to have “written the bible on SWAT,” Commander Heal provided consultancy for Condor as the company expanded its for-profit pursuit of the protest policing and “peacekeeping” markets. 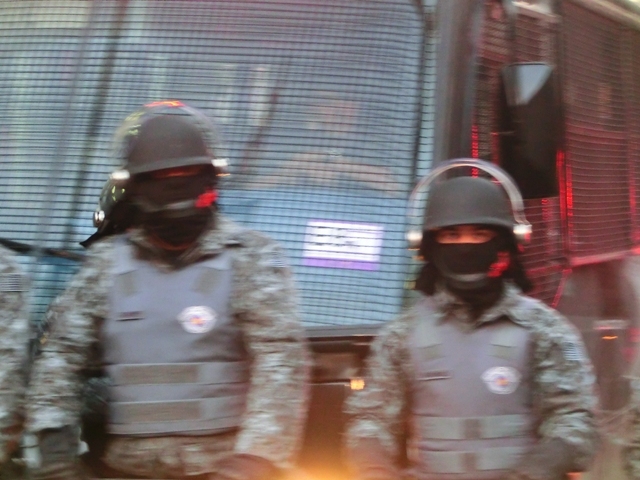 Recent investigations by Publica reveal continued U.S. involvement in the militarization of Brazilian police, with FBI consultations and trainings conducted in centers funded by the U.S. State Department. While the Brazilian government points to its policies to evade blame, corporate manufacturers like Condor remain protected behind warning labels, despite the increasingly abusive deployment of their products. In recent years Condor’s technologies have been repeatedly used against protocol to intentionally increase harm and even systematically torture people inTurkey, Bahrain and Egypt. “We always advise the right escalation of force,” promises Beni Iachan, a senior business analyst for Condor. Such advice legally allows manufacturers like Condor to avoid accountability, while supplying governments and their police with ever more methods for violently escalating force. While Condor’s revenue soars, around the world the company’s canisters, grenades and rubber bullets continue to be fired at close range at people’s heads and upper bodies. Devices are launched into enclosed spaces, reaching deadly levels of toxicity. And expired chemical agents bearing the Condor brand are being used against civilians, most recently documented on the streets of Venezuela. As accounts of riot control deaths and injuries pile up, it is becoming increasingly difficult for companies like Condor to cling to the “nonlethal” in their corporate name. Along with local activists, Brazilian human rights campaign group Tortura Nunca Mais, or Torture Never Again, and investigative journalists at Publica are working hard to raise public awareness around the role of these weapons in police abuse and the need for increased accountability. This allows hundreds of thousands of Condor weapons to be put in the hands of Brazilian security forces without government oversight. “Condor has exclusivity for 27 types of non-lethal equipment,” said Fonseca. The Brazilian government’s use of excessive force and failure to regulate their riot control practices are now under scrutiny by Amnesty International’s global campaign, Give Them A Yellow Card, which is monitoring the repression of peaceful protest during the World Cup. With all eyes now on Brazil — and its protesters — it’s time to not only resist the repression of protest rights, but also to confront the business incentives that fuel the escalation of force. “Corporations around the world like Condor see this as an opportunity to make a profit — and they are absolutely profiting off of state repression,” said Kimber Heinz of the global Facing Tear Gas campaign. Anna Feigenbaum is a lecturer in Media and Politics at Bournemouth University currently working on book about the history of tear gas. Dieser Beitrag wurde am Montag, 23. Juni 2014 um 14:32 Uhr veröffentlicht und wurde unter der Kategorie Politik abgelegt. Du kannst die Kommentare zu diesen Eintrag durch den RSS-Feed verfolgen.